They say goaltenders need to have short memories. That’s especially true in the National Lacrosse League. And even moreso when you’re a young netminder working to establish yourself as a bonafide starter. So, when he faced adversity a few weeks ago with a tough outing between the pipes, Roughnecks goaltender Christian Del Bianco took it in stride. On March 24, he was pulled early in the Riggers’ home loss to the Toronto Rock after allowing six goals on 11 shots in 13:56 minutes and watched the rest of the tilt from the bench, with Frank Scigliano manning the cage in relief. A week later he got the start against the Vancouver Stealth and with the added pressure of being able to clinch a playoff berth, he stopped 43 of the 52 shots he faced as Calgary punched their post-season ticket. Playing arguably the game’s toughest position, the third-year pro (more like second, as he only played 19 seconds at the end of the 2016 season) already shows the poise of a veteran. It’s that very attitude that gives head coach Curt Malawsky full confidence in the 20-year-old. 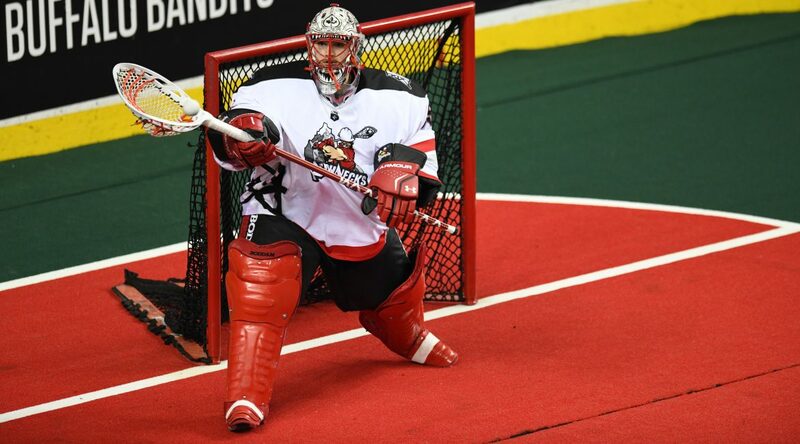 Del Bianco currently sits atop the NLL with an outstanding 10.30 GAA and a .803 save percentage. Despite his early success in the league, Del Bianco is staying humble. “The reality is you could have a couple of bad games and all of the sudden you’re back to ground zero,” he said. And what really matters now for Del Bianco is a strong regular-season finish, and a deep run in the playoffs. “Our goal wasn’t just to reach playoffs, it’s to win everything,” he said. “I think we have to keep building week by week.